Bring a park like setting to your own back yard with the help of our fine selection of outdoor picnic tables and picnic sets. 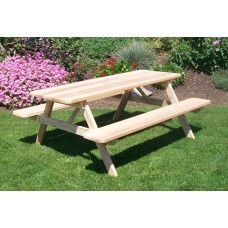 Enjoy the traditional picnic table with attached bench style, or enjoy detached benches with farmer's tables, or even backed benches for extra comfort. Many of our picnic tables are made from fine, outdoor ready, maintenance free cedar, too, which means they're ready to last for years. Scroll down and start shopping now. 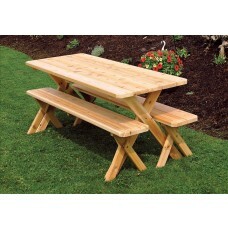 A sturdy, high-quality outdoor picnic table crafted from cedar wood. 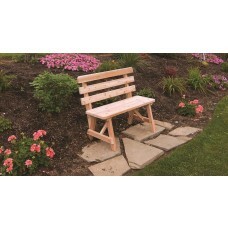 A traditional, backless bench hand-crafted from red cedar wood. 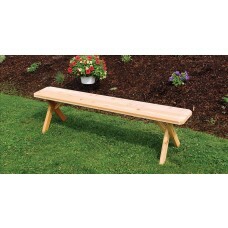 A hand-crafted, backless, crossleg bench made from red cedar. 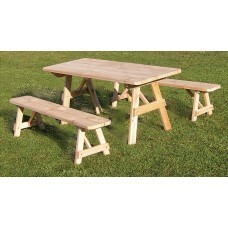 A sturdy and dependable crossleg picnic table with two benches. 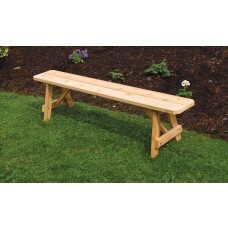 An outdoor backed bench hand-made from durable cedar wood. 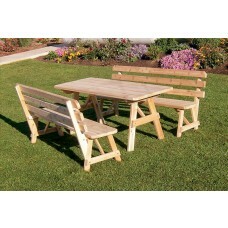 A square table and four backed benches made from cedar. Nothing says carefree fun quite like a picnic table, and it's the perfect place to settle in with a hot dog or some barbecue. 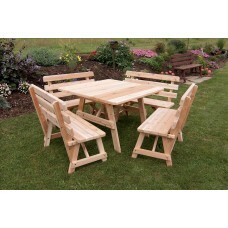 If you want your landscape to develop a truly park-like atmosphere then our full selection of picnic table sets are the way to go. The classic northern white cedar construction helps to make these picnic tables a cut above public park ones, however, ensuring maintenance free class. Stain them to hold the color of your choice with an oil based stain, or let them weather naturally to a pretty silvery grey. These tables typically seat four to six people, which means you can easily entertain the whole family. Purchase multiple tables to entertain larger groups. It's just that simple - and all of our picnic tables come with free shipping, too! 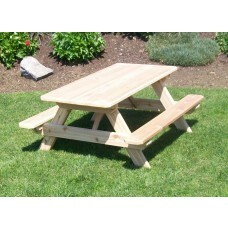 Order your new picnic table set today.